A surge of energy from activists has defined the Trump era. What’s the end game? Several activists who will be on the front lines of some of the biggest policy battles in the year ahead rank among Roll Call’s People to Watch in 2019. They include the leader of a fledgling environmental group pushing for aggressive action on climate change; the new president of Planned Parenthood, the lightning rod in the raging debate over abortion; and an expert on transportation safety who will be insisting on strong regulations to prevent deaths and injuries from driver-less vehicles. In the political arena, the leaders of a grassroots progressive movement, already one of the most powerful activist groups today, hope to build on gains made last election cycle. Just days after the 2018 midterm elections, hundreds of young, energized activists under the banner of a little-known environmental group stormed Capitol Hill, where they demonstrated outside of then-House Democratic Leader Nancy Pelosi’s office. Their demands were clear and urgent: Global warming is changing the climate at an alarming pace and lawmakers need to take quick and aggressive action to stave off catastrophe. Behind that and subsequent demonstrations was 25-year-old Varshini Prakash, a Boston resident who co-founded the group, called the Sunrise Movement, in July 2017. In the weeks after Democrats won the House majority, Prakash and her group have returned to Capitol Hill several times and continued to pressure the party to adopt what it calls the Green New Deal, an ambitious action plan touted and made popular recently by freshman Rep. Alexandria Ocasio-Cortez of New York. The Green New Deal, which evokes President Franklin D. Roosevelt’s 1930s “New Deal” stimulus package, calls for an ambitious overhaul of the U.S. economy by weaning the country off fossil fuels within a decade of writing legislation, creating clean energy jobs both domestically and abroad as well as a series of social and environmental justice reforms. After that first protest, Pelosi announced she would create a select committee to address climate change in the new Congress, which appeared to be an early win for the young climate activists. But the Select Committee on the Climate Crisis, which Pelosi created, has been deemed “toothless” by the activists because it can only make recommendations to standing committees, and does not have the power to write bills or issue subpoenas. Still, Prakash’s group and its hundreds of activists can be credited with quickly elevating the conversation on climate change in Washington and forcing the new House Democratic majority to move the issue to the top of their agenda. Before her entry onto the national stage, Prakash was advocating for climate action as a student at the University of Massachusetts Amherst, where she earned bachelor’s degrees in environmental and political science. She led and coordinated fossil fuel divestment campaigns through an organization called the Fossil Fuel Divestment Student Network, pushing the school to become the first public university to divest from direct fossil fuel investments. Her effort has received the nod from many environmental advocates who view young people as crucial to moving the needle on climate action, including from veteran activist and author Bill McKibben, saying in a Jan. 12 tweet that Sunrise Movement and Ocasio-Cortez understand the scale of action needed to address climate change, “especially since we waited so long” to start. “Everything has changed about how we discuss climate in the national debate,” Prakash says, adding that Democrats have quickly shifted from “half-measures” and “repeat propositions” to actually having conversations about how to rapidly transition the country to clean energy. Sunrise Movement is demanding that lawmakers who have taken donations from fossil fuel industries be precluded from joining the select committee or participating in climate legislation, forcing the party to grapple with an issue it has not had to deal with before. “The Democratic caucus I think is going to have to have this conversation because it hasn’t really come up before,” Democratic Rep. Kathy Castor of Florida, chairwoman of the Select Committee on the Climate Crisis, told CQ in December. Despite its disappointments with House Democratic leadership, Prakash says, her group will work with the newly created committee to highlight the need for urgent climate action. But they are not limiting themselves to Capitol Hill. 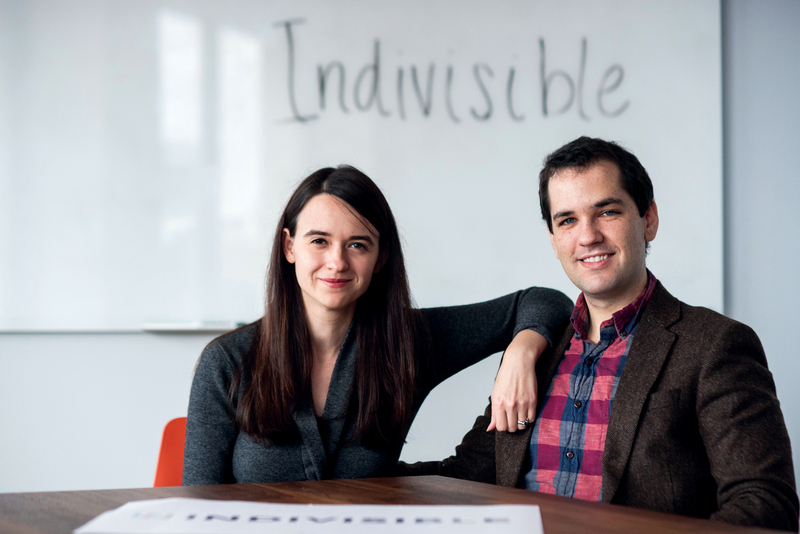 Of all the groups focused on challenging President Donald Trump and his policies, one of the largest and fastest-growing is Indivisible, a grassroots movement started by a husband-and-wife pair of former congressional aides shortly after the 2016 election. Stories about how Leah Greenberg and Ezra Levin’s “Practical Guide for Resisting the Trump Agenda” went viral online are now legend. Even more noteworthy is how the young Democratic couple seized the opportunity to put together one of the most powerful activist organizations in national politics today. More than 5,000 local chapters of Indivisible have been established, with at least one in every congressional district; the Washington headquarters has more than a million email addresses in its database; and the co-founders estimate that up to twice that many people identify themselves as members of an Indivisible group somewhere in the United States. Tactics outlined in the guide, such as facing down lawmakers at town halls, borrowed heavily from the tea party activists who gave Republicans control of Congress in 2010. That was no accident. Greenberg was an aide to Virginia Democratic Rep. Tom Perriello when he was swept out of office by the tea party wave, and Levin helped his hometown congressman, Democrat Lloyd Doggett of Austin, Texas, to the narrowest of his 12 election victories that year. Greenberg and Levin were just friends at that point, having met in Washington in 2008 at weekly get-togethers hosted by their fellow alums from Carleton College in Minnesota. The relationship blossomed as their career paths took them both through the Obama administration and to different policy groups, and they married in 2015. The lessons of the conservative wave in 2010 translated into a progressive wave in 2018 that gave Democrats the House majority. But Greenberg and Levin only see themselves as catalysts. Perhaps just as surprising is how Indivisible continues to grow, unlike the tea party that started to fade after its success eight years ago. The organization had its biggest show of activism on Jan. 3, with more than 160 events nationwide supporting HR 1, the pro-democracy bill introduced by Democrats on their first day running the House. 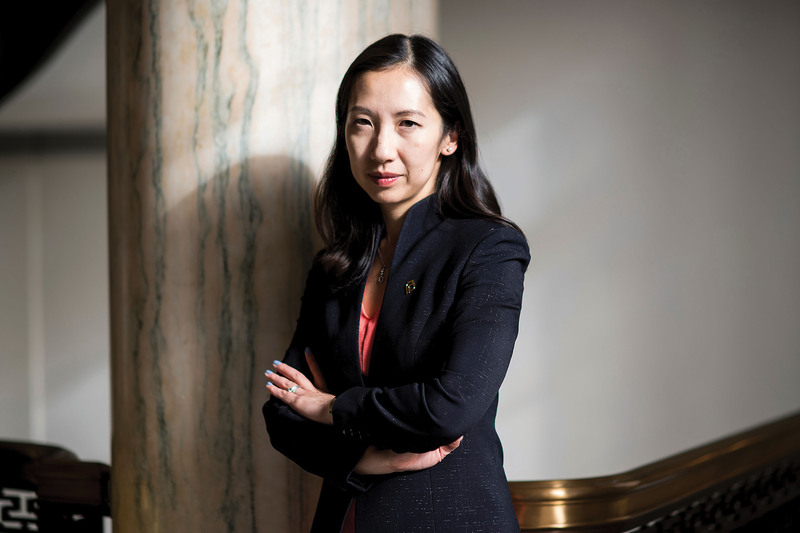 Years ago, Leana Wen frequented Planned Parenthood with her family as a patient, and now as the organization’s new president, she is ready to put up a fight to protect its place in the health care system. In November, Wen, 36, became the first physician in five decades to lead the health care and advocacy organization. She took the helm at a time when the Trump administration and Republican lawmakers have targeted the group, attempting to cut its funding and restrict abortion. But Wen sees an opening for change with Democratic control of the House this Congress. Wen’s history of tangling with the administration goes back to her stint as the health commissioner for the city of Baltimore, where in 2018 she successfully sued to block changes to the Teen Pregnancy Prevention Program. Her top federal policy priority now is to prevent changes that would bar Planned Parenthood from receiving funds under Title X, the nation’s federal family planning grant program, unless the organization stops performing abortions. Title X provides care for 4 million individuals, and about 1.6 million of them use Planned Parenthood for well-woman exams, birth control and sexually transmitted disease screenings. “Planned Parenthood is a health care provider just like every health care provider that I have ever worked for,” says Wen, who notes that the group is working in coalitions with its partners to fight the Trump administration’s proposed changes to the program. Wen is also watching legal battles that could affect her group since the confirmation of Justice Brett M. Kavanaugh last year. She estimates that at least 20 cases that are one or more steps away from the Supreme Court could affect reproductive health access. The group had a recent victory when the high court declined to take up a case related to two states’ attempts to cut funding to Planned Parenthood. On the state level, her organization hopes to see repeals of laws she sees as discriminatory and the introduction of new bills to protect and expand access to reproductive care. “We have more governors elected this cycle than for decades that are pro-reproductive health,” she says, adding that 19 state legislatures and the District of Columbia support abortion rights. Eleven Planned Parenthood alumni, according to Wen, have been elected to office, including Sen. Tina Smith, a Democrat from Minnesota, who is a former vice president. “We’re so excited to have champions in state legislatures in the House and the Senate, and we’ll be working with them to fight,” she says. 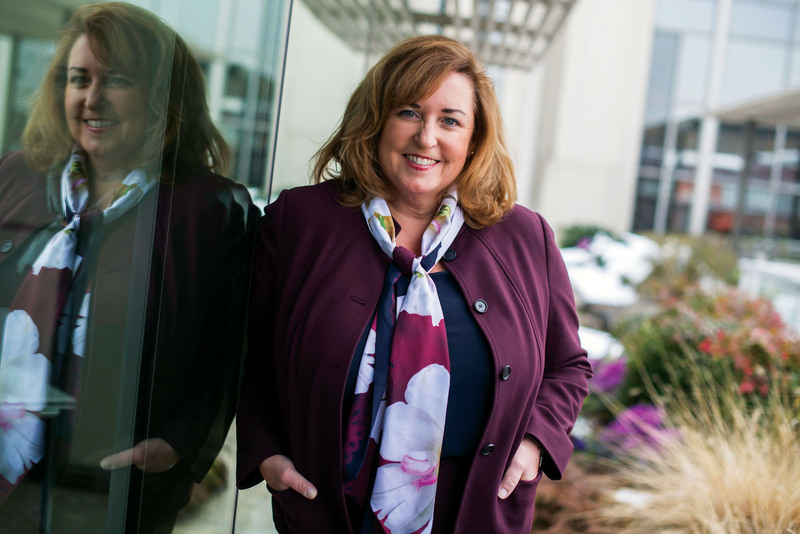 Cathy Chase is a 14-year veteran of battles to make roads safer for drivers, passengers, cyclists and pedestrians, but she faced a new challenge in the last Congress as an effort to promote driverless cars shifted into high gear. Persuaded that the technology would create jobs and shrink the 37,000 annual highway fatalities, lawmakers considered bills to adapt federal safety standards and pre-empt state restrictions on the cars’ design and performance, approving them by voice votes in the full House and a Senate committee in 2017. But after a series of high-profile accidents involving vehicles in self-drive mode, including one that killed a pedestrian in Arizona, they began taking a closer look and the legislation stalled as the 115th Congress adjourned. With Democrats now controlling the House, the road map for a driverless car bill will be rewritten. Chase, 50, who became president of Advocates for Highway and Auto Safety in 2018, will be a key voice in convincing lawmakers to make safety protections a key part of it. “She’s probably been the lead advocate for ensuring the autonomous vehicle is introduced in a safe fashion,” says Jack Gillis, executive director of the Consumer Federation of America and a board member of Chase’s group. In a lobbying world that often requires sharp elbows, he says Chase succeeds through her command of the subject. Rather than fight the technology, she pushes for better testing to ensure what’s being promised is what the public gets. Her record includes pressing for stronger truck safety rules, including limits on the time drivers spend on the road and the weight and length of double trailers. Driverless cars presented new challenges, she says, in part because they involved issues her group had never dealt with, such as cybersecurity. Chase says she initially took no position on the bills in the last Congress because she was trying to get support for improvements. Chase supports — to the point of arguing they should be made mandatory for all cars now — some of the features manufacturers say will make driverless cars safer, such as automatic emergency braking, lane-departure warning and blind-spot detection. But before Congress opens the door for mass production of driverless vehicles, there should be stronger regulations, and regulators need the power to enforce them, she says. Chase says people have become complacent about the current rate of about 100 highway deaths a day in the U.S., thinking of them as accidents. The reaction to accidents with driverless cars is different. “It’s a stunning mind shift to think about the car itself doing the running over, versus a human,” she says.